"For the moment, the broadly unanticipated behavior of world bond markets remains a conundrum. Bond price movements may be a short-term aberration, but it will be some time before we are able to better judge the forces underlying recent experience." A month later, Ben Bernanke, proposed the idea of a global saving glut as the main reason for low long-term real interest rates. In a world where capital markets are global, interest are determined by global forces and not by domestic macroeconomic conditions. This behavior is also very much related to the discussion around "global liquidity" and the potential influence of monetary policy in the US on monetary policy conditions in emerging markets. The difference is that in this case we are talking about short-term rates where we typically expect more control by the central bank and a stronger correlation domestic conditions. To illustrate this point let me use a slide from a presentation two days ago by Hyun Song Shin (BIS) at the Bank of England discussing the future agenda of central banks. The slide includes the following chart (click on it for a larger image). "This finding suggests that monetary policy has probably been systematically accommodative for most of the past decade. The deviation may, however, in part also reflect lower levels of equilibrium real interest rates that might introduce an upward bias in the traditional Taylor rule." Monetary policy can be too accommodative when central banks follow US interest rates to avoid appreciations of their currencies. But if monetary policy was that accommodative for more than a decade we should have seen increasing inflation rates during those years. That was not what we saw, inflation rates remain stable (and even decreasing) in most of these markets. Today, where interest rates remain very low compared to those implied by the Taylor rule, we talk about global deflation, not global inflation. So it must be that the fundamental cause must be related to lower levels of equilibrium real interest rates and these are determined by global forces (otherwise why would all countries behave in the same way). Interestingly, the deviations from the Taylor rule coincide with the period where global imbalances started. So here is yet another interest rate conundrum, this time related to short-term interest rates. How much do central banks control short-term rates in a world where capital markets are global? How relevant is a Taylor-rule approach to analyze the appropriateness of central bank interest rates? A recent report by the McKinsey Global Institute on the increasing amount of debt among advanced and emerging markets made it to the front page of many financial newspapers yesterday (e.g. the FT). 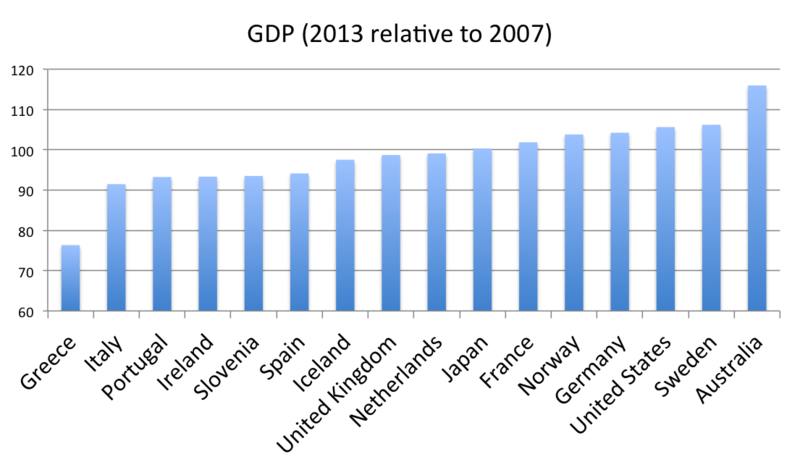 The report reminds us that in many countries debt is still going up as a % of GDP, that there is limited deleveraging. The Financial Times offers an interesting graphical tool to compare debt evolution for different countries. The data is interesting and it highlights the difficulties in deleveraging but, in my mind, it might lead to readers to reach a simplistic conclusion that is not correct: that everyone is living beyond its means, that we are not learning and that this will not end up well. Let me start with the obvious point: your debt is someone else's assets. The increase in debt as a % of GDP can be rephrased as an increase in assets as a % of GDP. It implies that the size of financial assets and liabilities is growing relative to GDP. That is not always bad. In many cases we think the opposite: the ratio of assets (or liabilities) to GDP is referred to as financial deepening and there is plenty of empirical evidence that it is positively correlated with growth and GDP per capita. To illustrate why only looking at debt can give you a very distorted picture of economic fundamentals let me choose a country that best illustrates this point: Singapore. In the graphical tool developed by the Financial Times one can see that government debt in Singapore has increased over the last years. Here is a longer time series from the World Economic Outlook (IMF) going back to 1990. 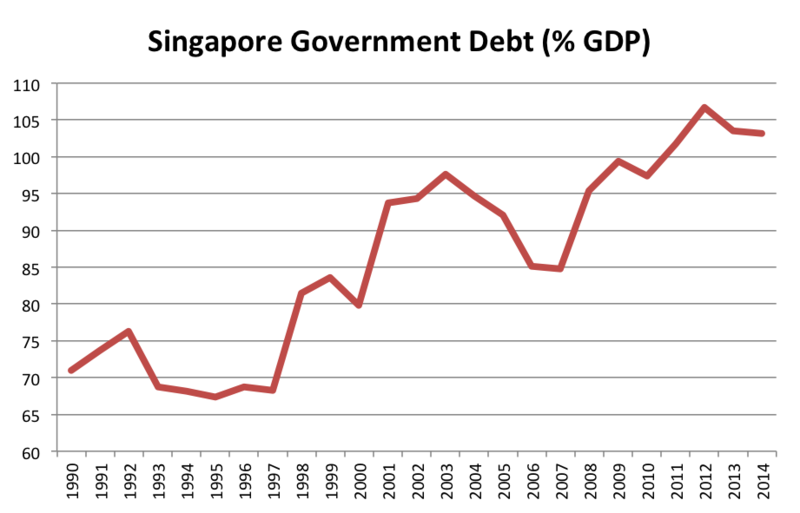 The current level of government debt is above a 100% (much higher than in 1990) and it puts Singapore in the same league as Spain or Ireland. 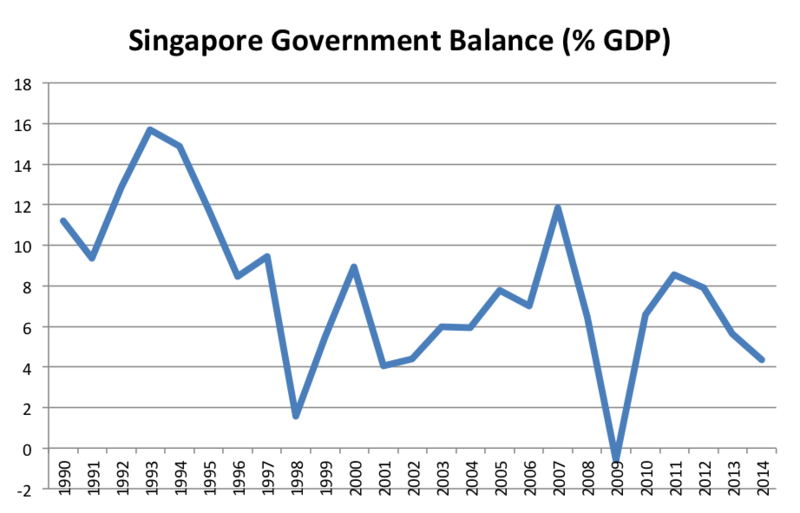 But here is the problem: the government of Singapore has been running a budget surplus since 1990 (and many times a very large budget surplus). What is going on? As the government of Singapore explains here, debt is not issued to deal with funding needs but to generate a set of Singapore government securities in order to develop a safe asset for the Singapore financial markets as well as for the compulsory national savings system called the Central Provident Fund. So while debt is very high, the value of assets is even higher and the balance sheet of the government of Singapore looks very healthy. This is admittedly an outlier among governments, most governments do not have assets that equal in value their liabilities. But even in those cases someone is holding government debt. And it might be that government debt is held by its own citizens that are in many ways the shareholders of the government. So the consolidated balance sheet of the country might still look great (e.g. Japan). This argument does not deny that the actual composition and ownership of assets and liabilities matters (even if by definition they always have to match). We know well that certain credit booms are indeed associated with crisis so worrying about debt is a good idea. But one has to be very careful interpreting analysis (and newspaper headlines) that only refer to the debt side of the balance sheet. A richer analysis that understand where the assets are and how they relate to issuance of debt is necessary. As we compare countries' performance since the beginning of the global financial crisis we try to look for patterns that explain differences in behavior and lessons on how to handle the next crisis. When doing that comparison we some times forget that looking at GDP growth does not always give us all the information we need to understand cross-country variation in performance. This variation can be due to demographic, labor market, productivity factors and while these three might be correlated over time, this is not always the case. 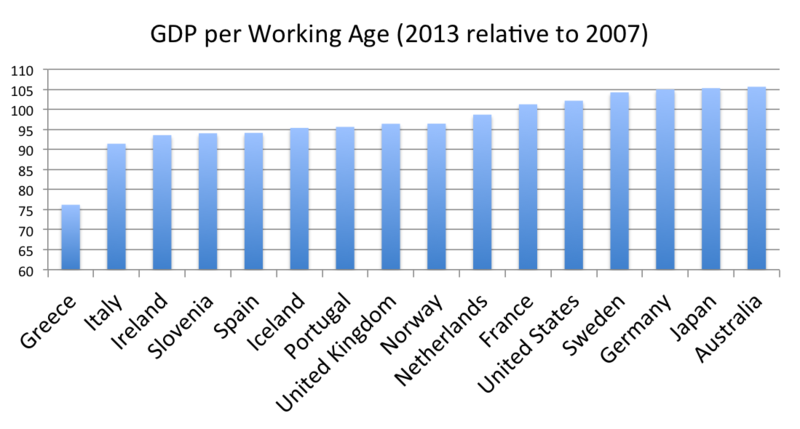 Here is a quick look at the years 2007-2013 for a group of advanced economies. The charts below plot the level of activity in 2013 measured as a ratio to the level in 2007. We see the usual suspects at the bottom of the list and we also see on the right hand side the ones that have managed to do better during the crisis years. Japan and the UK sit in the middle of the table. We now correct for the potential effect of changes in demographics in particular working-age population (defined as 16-64 years old). 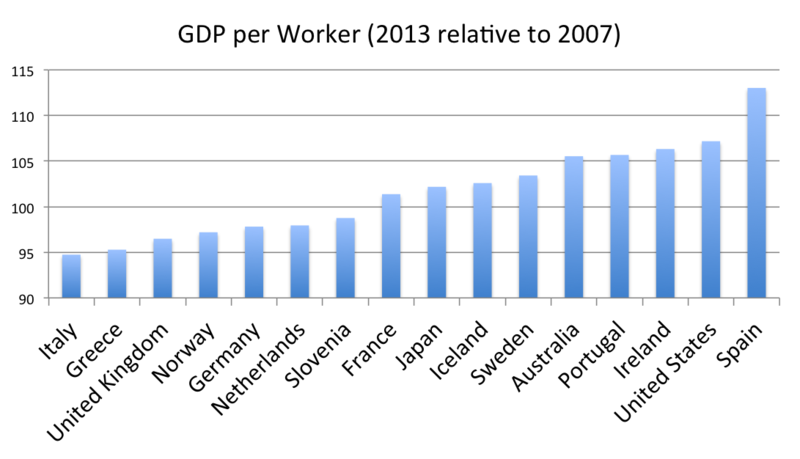 Finally, what about if we look at GDP per worker? This will give us a sense on performance on productivity of those working, abstracting from the labor market performance (ability to employ the working age population). While this is a rough measure of productivity it is affected by many factors including the possibility of sectoral shifts as least productive sectors see a bigger downturn. Some things do not change, Italy and Greece remain at the bottom of the list. But more movements on the other side. In particular, the UK is now the third-worst country and Japan goes back to the middle of the table. In the Euro area the biggest change happens in Ireland and Spain, both made it to the top 3. This means that for these two countries the labor market performance is the main drag on their GDP performance. Germany falls to the bottom half of the table suggesting that the strong German labor market performance has compensated a not too stellar growth rate of GDP per worker.